EndTime Issues ... : Can We Really Know "When"? Can We Really Know “When”? Because of a long “tarrying time” and an apparent delay to the eschaton, any hint of a set “near time” associated with the end elicits, “We are not to know.” Thus, regressive insights into prophetic information have occurred within the Christian world. Reality? Apocalyptic prophecy is loaded with timing clocks! These were some of Christ’s last words to the disciples. “But of that day and hour knoweth no man, no, not the angels of heaven, but my Father only” (Matthew 24:36; cf. Mark 13:32). The context explains a definite message. You still won’t know the very “day and the hour”! Paul exhorted believers not to forsake the worship assembly. Clearly, this was to energize and intensify their hope. It would solidify the anticipated understanding of Christ’s coming. “As you see the day approaching” (Hebrews 10:25b). The idiomatic expression here conveys a great reason for corporate worship by anticipating the day of Christ’s coming as it is actually approaching. The implication is strong that we will have evidence when that time is (implication: a specific season). “The night is far spent, the day is at hand: let us therefore cast off the works of darkness, and let us put on the armour of light” (Romans 13:12). Paul has more to say about that “protection” of light/knowledge as it distinctly relates to this end-time event. Look at this very carefully: “But of the times and the seasons, brethren, ye have no need that I write unto you [you already know (vs 5)]. For yourselves know perfectly that the day of the Lord so cometh as a thief in the night [to those who are unaware of the times (vss 3-4)]. For when they shall say, Peace and safety; then sudden destruction cometh upon them, as travail upon a woman with child; and they shall not escape. But ye, brethren, are not in darkness, that that day should overtake you as a thief. Ye are all the children of light, and the children of the day: we are not of the night, nor of darkness. Therefore let us not sleep, as do others; but let us watch and be sober” (I Thessalonians 5:1). God’s people have timing knowledge. They are children of “light.” The second-coming themes are heavily endowed with prophetic timing issues that they can “watch” for. God wants us to know these well, so the events will not come upon us suddenly – like a woman in labor. “Remember therefore how thou hast received and heard, and hold fast, and repent. If therefore thou shalt not watch, I will come on thee as a thief, and thou shalt not know what hour I will come upon thee” (Revelation 3:3). The Sardis church will experience the suddenness of a thief if they do not watch. If they do – a corollary – He won’t come as a thief. They would know. “We are not to be engrossed with speculations in regard to the times and the seasons which God has not revealed.” But we are to know what He has taught. When ye see these things come to pass, knowye that the kingdomof Godis at hand (Luke 21:31). What things? The collective signs He specifically gave! 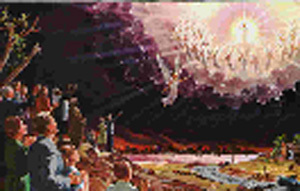 When these things begin to come to pass, then look up andlift up your heads, for your redemption draweth nigh (Luke 21:28). What other clocks has prophecy further revealed? After being wounded and healed, the beast becomes a church and state, then the end is in sight. A church/state began in Rome in 1929 with the Lateran Treaty (Revelation 17). When the signs of Christ’s apocalyptic discourse begin, all will occur within one generation – 40 years (Matthew 24:34). Statistically, that began in 1978 – that is precise on an exponential curve! The last three and a half years is called the “appointed time” and goes right up to the deliverance of God’s people – Daniel 8:17, 19; 12:7; Revelation 11:2-3, 12:14, 13:5. It begins with the abomination that leads to desolation. The spring feasts were associated with the first advent and the activation of the everlasting covenant. “The slaying of the Passover lamb was a shadow of the death of Christ. Says Paul: ‘Christ our Passover is sacrificed for us.’ 1 Corinthians 5:7. The sheaf of first fruits, which at the time of the Passover was waved before the Lord, was typical of the resurrection of Christ. Paul says, in speaking of the resurrection of the Lord and of all His people: ‘Christ the first fruits; afterward they that are Christ's at His coming." 1 Corinthians 15:23. Like the wave sheaf, which was the first ripe grain gathered before the harvest, Christ is the first fruits of that immortal harvest of redeemed ones that at the future resurrection shall be gathered into the garner of God. The fall feasts will be associated with the Second Advent and the fulfillment of the everlasting covenant. How close can we know the time? As close as the Bible clocks tell us. The explicit periods go right up to the deliverance of God’s people – the eve of the consummation. White, Ellen G.; Acts of the Apostles, p. 30. White, Ellen G.; The Desire of Ages, pp. 632-633. White, Ellen G.; Evangelism, 221. White, Ellen G.; The Review and Herald, November 22, 1906 (emphasis added). White, Ellen G.; Evangelism, p. 221 (emphasis added). White, Ellen G.; The Great Controversy, p. 399. White, Ellen G.; The Review and Herald, September 25, 1883.